Artem woke up in the back of the car. His vision came in to focus; stretching his cramped arms and legs he sat up. The argument of the night before came back to him. Imprinted on his retina was the image, through the rear window of his angry, red-faced father brandishing the family Bible. The harshness of his words delivered as a salvo of artillery aimed directly at him as he revved the accelerator and sped away. An uncomfortable, cold and lonely night shared only with the smell of the leather seats and a solitary ant, scurrying to and fro trying to find his quarry, was a shock to his system. He was used to snuggling asleep in a feather bed with soft pillows to rest his head on. Last night was cramped and chilly. He became aware of a strange and disturbing noise. Raising his head he peeked out of the car window. He beheld an amazing sight. 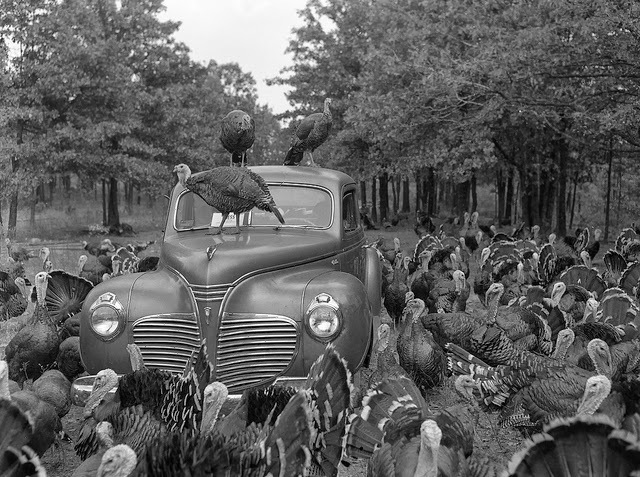 A rafter of turkeys surrounded his car. There were so many of them it was impossible to count them all. One turkey, the bravest and biggest of all, hopped on to the bonnet of the car quickly followed by another. Their claws scratched the metal, the noise was deafening, there was such a commotion and hubbub surrounding the scene Artem’s heart started beating fast, his breath coming in ragged little puffs. Artem made a great effort to get his feelings under control. The enormity of the situation struck him. He had to regain order or the family business would suffer. Wryly he nodded his head in acknowledgement of his father’s point from the day before. The old Russian ways didn’t always work for this next generation of farmers but the premise was the same. A beady eye scrutinised him warily through the murky windscreen. Artem shook away the idea of seeing an intelligent and inquisitive animal, more than a roast dinner; he couldn't afford to be compassionate about these birds, no matter what his heart told him. Business was business. Shooing the squawking birds away from the car by flapping his arm out of the open window, Artem turned the ignition key praying the engine would catch the first time. The noise of the motor startled the brave turkeys who flapped their wings wildly and gobbled louder than ever before. Inching the car forward Artem made slow progress marking a path through the frightened feathered birds, advancing gradually through the field. After what seemed an eternity but only a few minutes in reality he returned to the farmhouse. His father and brothers were standing at the kitchen door, he tooted the horn to gain their attention, a scowling face was replaced momentarily by one of relief as his father realised his eldest son had returned. The family was united in its efforts herding the turkeys back to their enclosures, enticing them with titbits of kitchen scraps; everything had now returned to order.